He was a master of detail who saw the big picture. He had the mind of a manager and the heart of an artist. His firm would build more than 500 buildings, a fascinating cross-section of American commerce and culture, including some of the earliest sky scrapers in the world. His work would help redefine the modern city in itself. Yet his greatest legacy may not be what he built, but what he imagined. Classically inspired and often monumental in scale, Daniel Burnham’s work sought to reconcile things often thought opposite: the practical and the ideal, business and art, and capitalism and democracy. At the center of it all was the idea of a vibrant urban community. 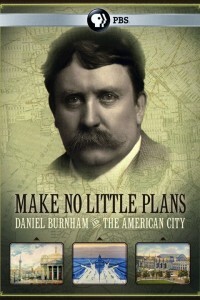 Make No Little Plans: Daniel Burnham and the American City, a new documentary film about visionary architect and city planner, Daniel Hudson Burnham (1846-1912).